Under the direction of Douglas T. Jackson, MD, JD, the Cardiothoracic Anesthesia program trains residents to give optimum care and management of patients undergoing cardiac surgery. Second year residents do a cardiac anesthesia rotation under the supervision of Dr. Jackson and his staff of Cardiothoracic Anesthesiologists and faculty members, Andrei Botea, MD and Yuriy Gubenko, MD. During this rotation residents gain experience in the anesthetic management of patients undergoing coronary bypass (including extensive experience in off-pump CABG), valve and aortic surgery. Residents receive training in the placement and use of pulmonary artery catheters as well as in transesophageal echocardiography. 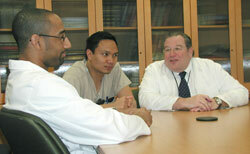 Residents may spend elective time in their CA-4 year doing further clinical work or research with the division. 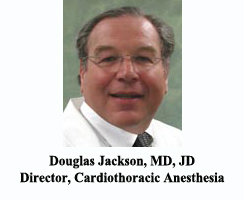 Dr. Jackson is also Director of the Cardiothoracic Intensive Care Unit. The integration of the anesthetic management of cardiac surgical patients with their postoperative ICU management provides residents with a unique insight into the perioperative care of these challenging patients.